Episode 126 is different from the rest. It's the introduction to Within the Trenches - Imagine Listening, an extension of the podcast featuring stories from the #IAM911 movement. What you are about to hear are true stories. While some have good outcomes, the majority are horrifying. A warning...if you suffer from PTSD or have suicidal tendencies this episode may be a trigger. LISTEN AT YOUR OWN RISK. This episode also touches on PTSD in 9-1-1 dispatch and a look at the dark humor that comes with the job. A shout out goes to Dave, Tim and Amy of Darkness Radio for having me on their show. Below you will find links to my interview and a shout out to Mike of Sword & Scale for having me on episode #82 of his podcast. As always if you have any questions or want to be a guest on show send an email to wttpodcast@gmail.com. Episode 125 features an interview with Kyle, a 9-1-1 dispatcher with Montgomery County Central Communications Center out of Indiana. He shares his 9-1-1 story and a recent call that follows a tragedy involving a mother who murdered her own children, stabbed herself in the neck but lived. She has been charged with two counts of murder and so far, has pleaded not guilty. This is an episode you don't want to miss. This is also part of the season finale of the Sword & Scale podcast. This is a short episode on the Within the Trenches Continuing Education Scholarship in association with the IAED, a recap of stories told in Ep. 123 and a shout out to Sword & Scale, an addicting true crime podcast that you must check out! I helped out on episode 82, their season finale and it is horrific! Per Mike, "DO NOT LISTEN TO EPISODE 82!" As always if you have any questions or you would like to be a guest on the show, send an email to wttpodcast@gmail.com. This episode features four of my personal #IAM911 movement stories. They are the stories that started it all and now they have more of an explanation to them. Enjoy, share and make sure to check out the IAED links below as well as the information on the Within the Trenches Continuing Education Scholarship. As always if you have any questions, comments or you want to be a guest on the show, send an email to wttpodcast@gmail.com. Within the Trenches episode 122 is sponsored by INdigital, a leader in Next-Gen Core Services. This episode features Jennifer, a dispatcher with Ogle County Sheriff’s Office out of Illinois and show regular Rob 'Big Mac' McMullen, director with Vigo County, Indiana and 1st VP of NENA. Jennifer shares her 9-1-1 story, we visit a tragic homicide case out of Montgomery County, Indiana and we share some updates on the #IAM911 movement, decals and the IAED/Within the Trenches Continuing Education Scholarship. This is a must listen so check it out and share! As always if you have any questions or you would like to be a guest on the show send an email to wttpodcast@gmail.com. Welcome to episode 121 of Within the Trenches. In this episode I had the opportunity to speak with Bailey, a Dispatcher and Corrections Officer with Mountrail Sheriff’s Department out of North Dakota. She is also a singer and songwriter and released a song based on her experience as a 9-1-1 professional back in April of 2016. The song was submitted as an #IAM911 movement post and is a must listen. Bailey shares her story in this episode along with her song. Below are links to her music and social media. This episode also highlights the 2017 Within the Trenches Continuing Education Scholarship that will help send a 9-1-1 professional to the IAED - 2017 NAVIGATOR conference in New Orleans, Louisiana. This is a great opportunity so don't miss out! As always, if you have any questions or you would like to be a guest on the show, send an email to wttpodcast@gmail.com. This is an episode you don't want to miss. There is an important message about the Within the Trenches Continuing Education Scholarship that will be pushed out soon for the IAED's 2017 Navigator conference so make sure to listen in. Make sure to check out the links below and as always if you have any questions or you want to be a guest on the show send an email to wttpodcast@gmail.com. Welcome to episode 119 or 9-1-1 of Within the Trenches. In this episode I had the chance to speak with Brianna, deputy director with Benton County Office of Emergency Communications in Arkansas and show regular, Rob “Big Mac” McMullen, director of Vigo County out of Indiana and 1st VP of NENA. We recorded live from the Hilton in Columbus, Ohio for the NENA Standards and Best Practices Conference as well as the Critical Issues Forum. This episode was a lot of fun to record and we covered a lot of topics so please make sure to check it out and share. As always if you have any questions or would like to be a guest on the show send an email to wttpodcast@gmail.com. Welcome back to Within the Trenches, a podcast based on the experience of being a 9-1-1 dispatcher. In this episode I finally got the chance to speak to Ryan, who serves with the 911 Wellness Foundation as well as a consultant for the 911 Training Institute and runs the blog and social media outlets for Operation 10-8. This has been about 2 years in the making but it was worth the wait. Also on the podcast is Lloyd, a previous guest on the show and a police dispatcher in Western Canada. This was a lot of fun to record. As always, if you have any questions or you would like to be a guest on the show email wttpodcast@gmail.com. Below you will find links for both Ryan and Lloyd's blogs and more. Welcome back to another episode of Within the Trenches, a podcast based on the experience of being a 9-1-1 dispatcher. Today is September 15th, 2016 and there are only 5 days left until the ability to submit a public comment closes. The #IAM911 movement has raised all kinds of awareness on the issue of reclassification for Public Safety Telecommunicators (PSTs) from "clerical" to "protective", but most of all the awareness of what PSTs go through on a day to day basis. The support from the Thin Gold Line, the public, those on the road, industry partners and those in Office has been amazing! With that said, episode 117 has a special guest. In this episode I spoke with a former Public Safety Telecommunicator and currently the U.S. Representative for California’s 35th District, Congresswoman Norma Torres. This was a lot of fun to record. She shared stories from her time in dispatch up to her current position in Congress. She recently sent a letter to the Office of Management and Budget (OMB) in reference to their decision to reject the reclassification proposal started by APCO International. It was an honor to have her on the podcast and below you will find a link to the letter she sent to the OMB, her social media and links to where you can provide information to APCO International and NENA for public comment. We only have 5 days left so let's push it! Continue to share your stories and go to the websites below and submit your public comment. As always if you have any questions or you would like to be a guest on the show send an email to wttpodcast@gmail.com. As always if you have any comments, questions or you would like to be a guest on the show send an email to wttpodcast@gmail.com. To see what you can do to help NENA's push for reclassification follow the link below. Also if you have not done so make sure to check out the t-shirts for the #IAM911 movement. The part of the public comments that interested me was the request for stories to show how we differ from commercial dispatchers and clerical workers. I felt that it was necessary to share stories as proof that PSTs are completely different. I shared a few stories and asked for others to share and the movement exploded. It has gone global and dispatchers everywhere are joining the movement to assist the reclassification push as well as bring to light what PSTs go through on a daily basis. This episode has much more so please check it out and share! As always if you have any questions or you would like to be a guest on the show, send an email to wttpodcast@gmail.com. Also remember to check out APCO International and NENA below to see where you can submit your public comments. If you want to join the #IAM911 movement you may do so by sharing a story by meme, text or video, remember to use #IAM911 at the end and submit it to Within the Trenches on Facebook or Twitter. Good morning and welcome to episode 114 of Within the Trenches, a podcast based on the experience of being a 9-1-1 dispatcher. A lot has happened since the last episode and instead of boring you with text I will let you get to this episode. Check out the topics below and make sure to listen and share! As always if you have any questions or you would like to be a guest on the show you can email us at wttpodcast@gmail.com. With all of the B.S. going on in the world right now I thought I would do a funny episode with the always epic Rob "Big Mac" McMullen. In this episode we share some personal stories along with a few funny 9-1-1 tapes. A big thanks goes out to the person who hooked me up with the tapes. They are awesome and shows what we deal with in dispatch. It's definitely light hearted and if you are looking for a laugh then make sure to check this out and share! As always if you have any questions or you want to be a guest on the show, send an email to wttpodcast@gmail.com. Welcome to Within the Trenches, a podcast based on the experience of being a 9-1-1 dispatcher. Episode 112 features Jordon, a dispatcher and CTO out of Colorado and this episode is kind of a behind the scenes look at the voiceover work for the podcast. It’s a funny one and towards the end we talk about marijuana, Colorado’s legalization, edibles and how they pertain to 9-1-1. It was a funny episode to record and I hope you enjoy it. As always if you have any questions or you would like to be a guest on the show send an email to wttpodcast@gmail.com. Welcome to an all new episode of Within the Trenches, a podcast based on the experience of being a 9-1-1 dispatcher. In this episode I spoke with the first recipient of the Within the Trenches Continuing Education Scholarship. Her name is Leslie, a Telecommunicator, CTO and 2016 recipient of the Mary Antley Telecommunicator of the Year Award. She dispatches out of New Hanover County in North Carolina and it was an honor to have her on the show. We recorded live from the Indiana Convention Center for the 2016 National NENA Conference & Expo. This episode is sponsored by NENA and INdigital - A leader in Next-Gen Core Services. I was given an opportunity three years ago to bring my newly created podcast to the National NENA conference in Charlotte North Carolina. It changed my life in so many ways. I told my wife that one day I would pay it forward and I did that by creating a scholarship that would send a dispatcher to the national conference. There is so much to say about Leslie but I would rather you hear her story in her own words. Once again it was an honor to have her on the show and I see big things coming in her future. Keep doing what you do! Welcome to an all new episode of Within the Trenches, a podcast based on the experience of being a 9-1-1 dispatcher. In this episode I spoke with dispatchers from Indiana with the code names of Maverick and Phoenix. We recorded live from the Indiana Convention Center for the 2016 National NENA Conference & Expo. This episode is sponsored by NENA and INdigital - A leader in Next-Gen Core Services. This episode is hilarious and I can't even start to explain the stories we told but it was a good time and if you are looking for a good laugh make sure to listen and share. As always if you have any questions or would like to be a guest on the show please send an email to wttpodcast@gmail.com. Within the Trenches is back with episode 109 and you don't want to miss this one. I got the chance to speak with three great individuals including Greg with Van Buren County 9-1-1 along with Jim and Dee Ann of the 9-1-1 Wellness Foundation. We had a great time recording this episode of the show but we also learned a lot. In this episode we shared several stories and Jim talked about his class at the 2016 Michigan NENA conference as well as what the foundation is currently working on for the national conference and future endeavors. "This is how it starts, it's where your change begins." I will never forget that day. Thank you to everyone who helped me in the beginning and to those who continue to help and believe in what I am doing. I love doing what I do! If you have any questions or would like to be a guest on the show please send an email to wttpodcast@gmail.com. Good evening and welcome back to another episode of Within the Trenches. This past week I was in Lansing, Michigan for the 2016 Michigan NENA conference. It could not have gone any better. I got the chance to catch up with old friends and met a lot of new ones. It was great to see all of you and it was especially nice to see the crew from Van Buren County 9-1-1, Greg, Mike and Jennifer. It had been a while since I last saw them but we fell right back into it when we recorded this together. In episode 108 we visit our first calls, suicide by gun, domestic violence and spam. This is a must listen so make sure to check it out and share! As always, if you have any questions or would like to be a guest on the show send an email to wttpodcast@gmail.com. Within the Trenches is back! Episode 107 is sponsored by INdigital - A leader in Next-Gen Core Services. In this episode I sat down with my brother Fernando to tell some personal stories that include a possible UFO sighting and a 9-1-1 tape of those sightings. A shoutout goes to OpenMinds - UFO News and Investigations for the short story and the audio. Also the Sons and Daughters of Dispatch decals are available for purchase so get yours while you can! Another shoutout goes to Heather of Absolute Photography in Holland, MI for assisting with the first few orders of vinyl decals. You do amazing work and if anyone is looking for vinyl Heather is your top choice! This episode is a must listen so make sure to check it out and share! As always if you have any questions or you would like to be a guest on the show send an email to wttpodcast@gmail.com. Welcome to episode 106 of Within the Trenches! This episode is sponsored by Indiana NENA and INdigital, a leader in Next-Gen Core Services. In this episode I sat down with the ladies of Vigo County 9-1-1 Indiana and it was epic! Joining me was dispatchers, Chelsey, Kelsie, Heather and Hanna along with their director Rob "Big Mac" McMullen. There are so many different topics on here that I can't even begin to talk about it. You have to listen to it to understand. This is a must listen so make sure to check it out and share it up! As always if you have any questions or you want to be a guest on the show you can email the show at wttpodcast@gmail.com. Recording live from the 2016 Indiana NENA/APCO Conference in Indianapolis, Indiana it's episode 105 of Within the Trenches, sponsored by Indiana NENA and INdigital - A leader in Next-Gen Core Services. This episode is entitled "Open Mic". My guest list consists of show regular Rob, Nicole, Assistant Director of Montgomery County, Lindsey, dispatcher with Fulton County and the audience/attendees of the conference. This was the first time I have ever done a podcast with a live audience and it turned out amazing! We tell all kinds of funny stories and some of them may make you blush. There is a warning in the beginning so listen and remember, you have been warned. This is a must listen so make sure to check it out and share! As always if you have any questions or if you want to be a guest on the show send an email to wttpodcast@gmail.com. "Annie are you ok, are you ok Annie?" "I am the drunk driver"
Recording live from the 2016 Indiana NENA/APCO Conference in Indianapolis, Indiana it's episode 104 of Within the Trenches, sponsored by Indiana NENA and INdigital - A leader in Next-Gen Core Services. In this episode, show regular, Rob "Big Mac" McMullen joined me to talk about anything and everything we could think of. I can't even begin to mention what all we talked about but shout outs go to Leah of Grand Traverse, Smart911, the graphic design talents of Rizzo and the 911 Wellness Foundation. This is a must listen so check it out, share and share again. As always if you have any questions or would like to be a guest on the show send an email to wttpodcast@gmail.com. Welcome to Within the Trenches and this is episode 103. This episode is sponsored by INdigital - A leader in Next Gen Core Services. Last week for episode 102 I spoke with Lloyd out of Canada and he shared his 911 story and touched on mental health and dispatch wellness as well as how he started Dispatch Monkey. If you missed that episode please make sure to go and listen and share. Today’s guest is Daphanie, Communications Training Coordinator and Shift Supervisor, out of Martin County Fire/Rescue in Florida. In this episode Daphanie shared her 911 dispatch story as well as some calls that have impacted her life. This is a must listen so please check this out, share and share again. Below you will find links to Daphanie’s articles with IAED, links to IAED and Threadsy Tee. Welcome to episode 102 of the Within the Trenches Podcast, a podcast based on the experience of being a 911 dispatcher. The show is going strong and while stories are the main focus of the podcast, 911 companies and organizations are coming on the show to talk about what they are doing. The way I look at it is that if I can supply dispatchers with some free training through the podcast, why not? On episode 101 I spoke with Eddie of St. Louis County, Missouri and he shared his 911 story as well as what it was like for him in the dispatch center during the Ferguson riots. If you missed that episode, please make sure to go and listen and share. Today’s guest is known throughout social media and the blogosphere as Dispatch Monkey but today we find out who the man is behind the monkey…or curtain. This person is a police dispatcher working for an agency in western Canada and his given name is Lloyd. This is a must listen so make sure to check it out, share, check out Dispatch Monkey's links below and share! Episode 100! Man oh man I can’t believe it. It’s been one crazy ride and I wouldn’t change a thing. 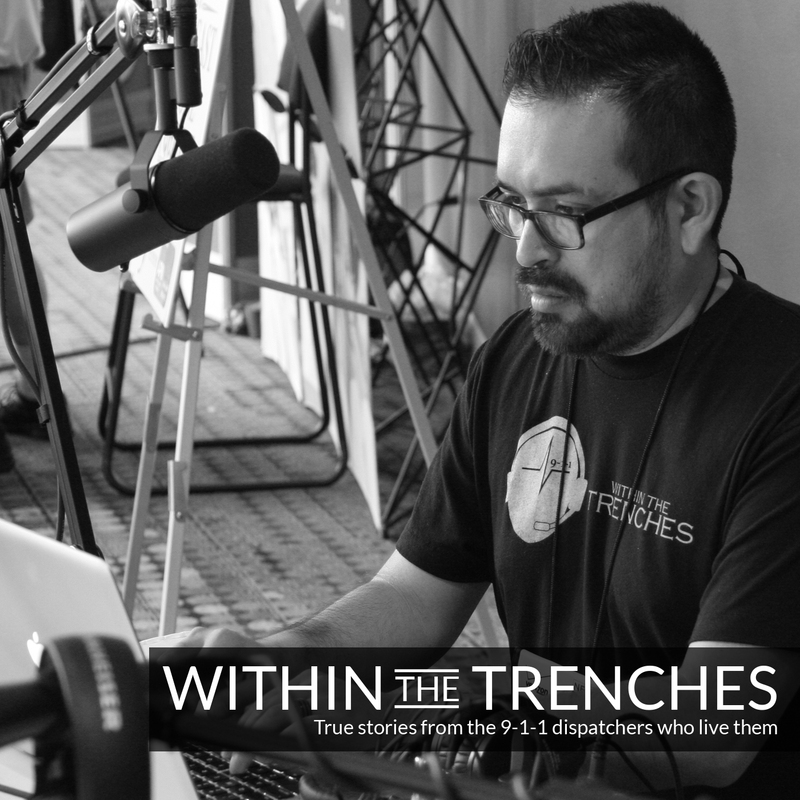 Welcome to Within the Trenches, a podcast based on the experience of being a 911 dispatcher. I have interviewed dispatchers from all over the United States including Ireland, Canada and Australia. I have also interviewed 911 leaders, directors and 911 pro companies and organizations such as the 911 Wellness Foundation, Dispatch Magazine Online, NENA, APCO, TERT, EENA, INdigital, Success Communications, Agency360, 911Trainer.com, Avaya, The Denise Amber Lee Foundation, Xybix, Smart911, The Cool Kids of 911 and more! I feel truly blessed to have had the opportunity to interview and meet so many amazing people. It started as a school project and blew up from there. In this episode I go back and reflect on the beginning of my journey. I play clips from episodes 1, 6 and 12 and share all kinds of stories. I hope you enjoy them and I will post links to those episodes below. Don’t forget that you have until April 15th 2016 to apply for the Within the Trenches Continuing Education Scholarship. This is a great opportunity for you to attend a national conference so don’t miss out. Thank you to everyone who believed in me and this project. I don’t plan on stopping any time soon. I see this show doing so many things in the future so stay tuned. Here’s to 100 more episodes and beyond. Cheers! Welcome to episode 98 of Within the Trenches. A lot has been going on lately and I can’t make any announcements yet but as soon as I get the green light I will do so. Now along with that there are some big things coming up and I know the National NENA conference is a few months away but I can’t help but mention that the podcast will be better than ever. I’m working on a scholarship for one lucky dispatcher. The scholarship will include a full registration, travel stipend and a couple others things but complete details and open registration will not come out until early next month. If you have never been to a conference, this is your chance. A couple t-shirt campaigns are coming up as well and a portion of the proceeds will go to that scholarship so when it hits make sure to order your shirt, it’s going to an excellent cause. And in case you’re wondering the shirt campaigns will include the Sons and Daughters of Dispatch design that I posted on Facebook and Twitter. Today’s episode is going to cover a hot topic on the skewed public perception of dispatch along with how much we do and how it can affect us. We also share a couple of videos on dispatcher tasks from Facebook Page “Inside the Fire: A Page For First Responders” and “The Operator” by Bridge the Divide Media. Joining me for this episode are a few of my admins from the podcast fan page, Shae, Victoria and Kelli. This is a must listen so check it out and share! As always if you have any questions or you would like to be a guest on the show send an email to wttpodcast@gmail.com. Below you will find links to the videos mentioned in this podcast.